What distinguishes us from other organizers? In a nutshell, passion for our profession and the country is what sets us apart from the rest. We have learned our trade from scratch as tour guides we know what our customers expect! We are not one of those agents satisfied with seeing hotels once a year during their annual inspection tours. Instead, we regularly stay at those hotels, together with the clients. We believe this is possible only within the frame work of a small, familiar company. Therefore, it is not our intention to land as many tours as possible and organize them run-of-the-mill style. Instead, you may expect something special from us. Take our word for it! Should problems occur, we’ll take care of them ourselves. Not some clerk as is often the rule in large companies. And, of course, we communicate with our clients in English or German. From us you won’t get program elements that don’t fit together. In addition, Axel and Tobias are real experts and country connoisseurs. They not only know how to sell tours. They speak the national language and wrote quite a few books about Myanmar. They are not the kind of people who sell tours in Myanmar today and cameras in Vietnam tomorrow. Try us – you won’t regret it! We offer tailor-made tours in Myanmar: complete packages, but also individual services. Our services are not limited to day-to-day business: our customers can expect something special from us! In 2004 Axel Bruns accompanied and advised a team of the STERN magazine Hamburg, which wrote an article series about the world religions. Myanmar served as an example of Buddhism, and during a ten-day journey through the country he brought the editors together with believers, monks and scholars to contribute to the success of the project. The article series was so successful that it also appeared in book form: Die sechs Weltreligionen, Stern-Buch, Ullstein-Verlag, Berlin, 2005. In December 2006 Axel Bruns accompanied the German director Roman Teufel (rtv-Studio) and his team during the shooting of the film Myanmar – Journey into a lost time. We are very proud of having made a major contribution to one of the best films ever made about this country. In March 2017 Tobias Esche organized several trips of the well-known German television journalist Robert Hetkämper (ARD/NDR) with his team through Myanmar (see his contribution on ARD). An organizational challenge of a special kind. In other words: We are the people you are looking for! Even if you are not a reporter . . .
We seek a form of tourism that takes care of the country’s natural resources. And its people, too! We leave mass tourism to those competitors who would be described best as savvy shoppers. Who push down the prices to the disadvantage of local employees and service providers. Let’s not get deluded: It’s a huge difference if one travels with 25 people in a 30-seater-bus or with a small group in a van. Or as a twosome in a saloon car. Certainly, it is more expensive! But we believe this additional expense is worth it. Small is beautiful! And we firmly believe that as much as possible of your money should go to those who need it most: workers, farmers and other low-income earners. Keyword: community based tourism! However, we refuse to follow the example of some tour operators who refuse to book certain hotels, because they belong to the ‘wrong’ people. For us, the wellbeing of our clients is more important than ideology. What’s the use of staying in a private dump if there’s a good government hotel next door? Or one that belongs to a so-called crony? Sometimes our clients ask us to stay at ‘small typical guest houses’ or bad & breakfast establishments, run by ordinary people. Unfortunately, these are quite rare in Myanmar. Ordinary people simply don’t open a guest house. Because they don’t have the necessary funds. And those who have them, don’t belong to the poor. It’s that simple! On 3rd May 2018 cyclone Nargis struck the Ayeyarwady delta. More than 100.000 people lost their life. Shortly after,we started our relief action. We sent a truck with relief supplies (food, blankets, tarpaulins, clothing, etc.) to the city of Pyapon, which was severely affected by the storm. There we transferred the goods to a large boat and called at six villages where we distributed our goods. Since we had no experience with such relief operations, we sometimes hit a snag. Therefore, for the next relief operations we sent a reconnaissance team ahead in order to make our operations more effective. It turned out, that the limitation to one-day action was detrimental to our goals. Accordingly, we arranged to stay overnight at Pyapon. Further relief actions took place on 22/23 May and 2/3 June. They, too, were limited to the distribution of supplies. During the second journey we met refugees from the fishing village Mingala Thaung Tan, which is situated directly at the sea, in a village near Pyapon. It was severely devastated by the storm (only three of a hundred and twenty houses were left standing) and 117 people died. The people asked us for fishing nets, and we promised them to visit their village during our next journey. When we saw the devastation on June 2nd, we spontaneously had the idea to rebuild the village. Fourteen days later the reconstruction began. It caused severe logistical problems. Even though the houses were quite small, we needed a considerable amount of bamboo as well as roof and wall elements, made from the leaves of the Nipa palm. After all, 130 houses had to be rebuilt! We brought craftsmen from Yangon with us and two members of our team stayed in the village during the whole construction period. Of course, the villagers, too, lend a helping hand. One month later, the people moved into their new homes! Of course we encountered several problems: theft, jealousy, just to name two. But in the end the whole project was a huge success. Due to the high demand for building materials after the storm, we – like many others – were forced to use inferior building materials (e.g. unripe bamboo) during the construction of the village. But our aim was to help as quickly as possible. The people needed a living space and a roof over their heads! Two years later the bamboo pillars had become brittle. We replaced them with ones made of solid wood. Quite contrary to 2008 it was available without any problems. However, without the selfless commitment of our tour guides and the generous donations from friends and customers (our special thanks go to Mr. Roger Weiss from Essen/Ruhr, who unfortunately died in the meantime!) we wouldn’t have been able to rebuild the village in such a short time. All our thanks go to them! We left Yangon at six in the morning. 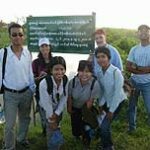 Our group included the following tour guides (see photo below): Ma Shin Hnin Aye, Ma Mu Mu Nyunt, Ma Sandar, Ma Nwe Nwe, U Soe Paing and U Yan Naing plus myself. In addition, there was the ZEIT journalist Marian Blasberg and his photographer. Marian has captured his impressions in what I think was a very successful article in the ZEIT magazine (July 2009: Die Zocker von Rangun | ZEIT ONLINE) – although everything should be taken with a pinch of salt. We reached the town of Pyapon, the ‘operational base’ of our relief efforts, around 10.30 a.m. and were invited for breakfast by Yan Naing in the uncle’s house – of course, we had Mohinga – what else? The uncle runs a grocery store in Pyapon and supported our activities in an exemplary way. He did not miss the opportunity to accompany us to Mingala Thaung Tan. After we had parked our belongings in the hotel, we set off by boat. Although I was in the area for the first time (we needed a permit, which was issued without any problems), everything seemed strangely familiar to me – I had already got to know the area by photo and film. There was not much to see of the effects of the storm. Everything seemed to be going as usual. After about three hours we reached the village of Mya Sein Kan, which includes the rebuilt village of Mingala Thaung Tan. Because of low water we couldn’t go directly to ‘our’ village. From there it was about 20 minutes via the remains of the dam built by us a few months ago (made of rice sacks filled with sea sand). In the village we were welcomed in the village assembly house and tea was served. After word of our arrival got around, the house filled up quickly. It was built with the same technique as all the houses in the village: bamboo and nipa palm leaves. The village headman expressed his thanks in the name of all villagers. I replied that it was a great pleasure for our group and the donors to see how beautiful the village had become. And it was truly impressive: Those who had seen the old photos could only marvel. Where there had been devastation, a proper village was now standing. I had a look inside some of the huts and was amazed at how big they looked from the inside: definitely sufficient space for the inhabitants… We noticed that very few houses had a toilet – when I asked if it wouldn’t be a good idea if all houses had one, I didn’t get the expected approval. Obviously they preferred the ‘good old way’… Later we were able to convince the villagers and today almost all houses have a toilet! The principal of the school in Thamein Htaw had invited us for lunch in the morning and we gladly accepted her invitation. She also asked me to help with the construction of a building for her school. Since we still had considerable funds, we agreed to support this school, too. Later we were informed that another donor had been found for this project. However, I wasn’t worried at all that that we’d be able to make use of those funds properly: On the way I saw many destroyed schools where the lessons took place in tents and bamboo huts. In the afternoon of 9th October we went back to Yangon on very bad roads, fully aware that our relief action was a complete success! What lasts for a long time will finally be good – on 26 December 2009 Axel Bruns together with some donors who had not shied away from the long journey officially opened the school building in the village of Thamein Taw near the town of Pyapon in the Ayeyarwady Delta, which had been rebuilt with donations after the storm. It has been in operation since June 2009, but it was only now that the opportunity for the ceremonial opening arose. By the way, the school bears the beautiful name ‘Ocean of Knowledge’ – nouns are hopefully omens here… We once again thank all those who made this project possible with their donations. On 27.10. I was with Mu Mu and Shin in Yangon to visit some orphanages – again I was surprised how much commitment they showed or had shown: In the Myint Thar Myo Oo Child Development & Monastic Education School (South Okkalapa Township) they had paid the salary of the teachers for one year. By the way, the large school building had been paid for by a Japanese organization. The project, in which novices as well as numerous children from the neighbourhood go to school, is led by Abbot Ashin Pannacara, who stood out well from some shopkeepers who are cavorting in other monasteries. We also visited an orphanage for AIDS orphans in East Dagon and another orphanage in Mingaladon Township, where I had a house built with donations (but that was before the cyclone). It was amazing to see the differences between the different projects in terms of organisation. Yeah, there’s always this and that: Unfortunately, we also had to find that out in our group. With great indignation the people of our team told me that a tour guide had enriched himself by branching off commission for himself when buying building materials. Our attempt to make him liable unfortunately failed. In the meantime I have visited Mingala Thaung Tan and Thamein Taw many times and enjoy the pretty village again and again, whose inhabitants dedicate themselves in the meantime beside the ancestral fishery also to cattle breeding. In the meantime we have replaced the bamboo pillars, which were built in the (necessary!) hurry at that time, with solid wooden pillars. Our last action was the donation of solar panels to all houses in the village, so that all residents can now enjoy electric light – at least as long as they clean the panels regularly. With this the last donation money was spent! A few concluding words on this topic: we take a fundamentally critical view of the work of NGOs in developing countries. Myanmar has long resisted their activities in the country, because the country’s leadership felt that it was quite capable of helping itself. Which we fundamentally welcome! Since the democratisation of the country, however, the number of NGOs has risen sharply. In Yangon, for example, this has led to a sharp increase in rents paid by foreigners. No wonder UNICEF pays $85,000 a month to rent its house. That’s more than a million dollars a year! In our opinion, this is more like the purchase price of the house. We ourselves were confronted with the difficulties of ‘professional’ aid after the successful reconstruction project in Mingala Thaung Tan. Our major donor was so impressed with our performance that he asked me to look for more ways to help. The budget was 100.000 Euro per year. This can do a lot in Myanmar and I thought about buying a ship and driving through the delta with a team of nurses and doctors to help where you can’t get there by car. Now, in my experience, it is not possible to equip a ship and just get started. At the latest after the second voyage, the authorities would have become aware and would have asked whether the whole thing had been registered and approved. And those who – like me – know the Burmese bureaucracy know what that means: a true Sisyphus work with an uncertain outcome. So I decided to work with an NGO that was already established and started looking. I did not find anything, neither with local nor with foreign NGOs: everyone wanted to have the money – but not in my sense, but for their own projects!Was nicht in meinem Sinne war, denn immerhin stand ich mit meinem guten Namen dafür ein, dass die Gelder bestimmungsgemäß verwendet wurden. Also gab ich den Auftrag mit Bedauern zurück und verwies den potentiellen Spender an ein bereits bestehendes Projekt, das m. E. einen guten Job machte. I had a similar experience when setting up a school near Mt. Popa: the money was highly sought after, but unfortunately the potential recipients had other plans than I had in mind. The mayor found it more important to buy a moped and the teachers wanted to improve their accommodation. The school itself was completely in order, I was told. So I was forced to return the money I had received to the donors. To avoid misunderstandings, I would always be willing to take a similar action in an emergency as I did after Storm Nargis! But only under the condition that I can keep the threads in my hand and watch over the use of the funds. I have seen too much waste of funds that were donated with an honest heart and with the best intention and then seeped into unmanageable channels. All’s good that ends good – on 26 December 2009 Axel Bruns together with some donors who were undeterred by the long journey. officially opened the school building in the village of Thamein Taw near Pyapon. It had been rebuilt with the help of donations after the storm. The school had been in operation since June 2009, but it was only now that the opportunity for the ceremonial opening arose. By the way, the school bears the beautiful name ‘Ocean of Knowledge’ – the name says it all! We once again thank all those who made this project possible with their donations. On 27.10.2010 I visited some orphanages in Yangon with Mu Mu and Shin. Again, I was surprised how much commitment they had shown: In the Myint Thar Myo Oo Child Development & Monastic Education School (South Okkalapa Township) they had paid the salary of the teachers for one year. By the way, the large school building had been paid for by a Japanese organization. The project serves as school for novices as well as numerous children from the neighbourhood. The headmaster is Abbot Ashin Pannacara, a welcome contrast to the busybody abbots who are so common in other monasteries. We also visited an orphanage for AIDS orphans in East Dagon and another orphanage in Mingaladon Township where we repaired the roof. There I had a house built with donations (but that was before the cyclone). It was amazing to see the differences between the different projects in terms of organisation. Occasionally, there’s one rotten apple in the basket. Unfortunately, this proofed to be the case in our group as well. With great indignation the members of our team told me that one tour guide had enriched himself by branching off commission when buying building materials. Our attempt to make him liable, unfortunately failed. In the meantime, I have visited Mingala Thaung Tan and Thamein Taw many times and always enjoy the neat village. We always drop by at the newly built village school where the students sing a song for us. Nearly hundred children have been born after the disaster. That makes us especially happy: Mingala Thaung Tan is alive! Some inhabitants have taken up cattle breeding as a side business to fishery. In the meantime we had replaced the bamboo pillars, which were built in the (necessary!) hurry at the time of construction, with solid wooden pillars. Our last help project was the donation of solar panels to all houses in the village. Now all residents can enjoy electric light – at least as long as they clean the panels regularly. With this the last of the donors’ money was spent! A few concluding words on this topic: We take a fundamentally critical view of the work of NGOs in developing countries. Myanmar has long resisted their activities in the country, because the country’s leadership felt that it was quite capable of helping itself. Which we fundamentally welcome! Since the democratization of the country, however, the number of NGOs has risen sharply. In Yangon, for example, this has led to a sharp increase in rents payable by foreigners. No wonder, as UNICEF pays $85,000 a month to rent its house. That’s more than a million dollars a year! In our opinion, this is more like the purchase price of the house. We ourselves were confronted with the difficulties of ‘professional’ aid after the successful reconstruction project in Mingala Thaung Tan. Our major donor was so impressed with our performance that he asked me to look for other projects. He offered me a budget of 100.000 Euro per year. With this amount a lot can be done in Myanmar. I thought about buying a ship sailing the delta with a team of nurses and doctors, going to places not accessible by road. Now, in my experience, it is not possible to equip a ship and just get started. At the latest after the second voyage, the authorities would have become aware of it and would have asked whether the whole thing had been registered and approved. And those who – like me – are familiar with the Burmese bureaucracy know what that means: a truly Sisyphean task with an uncertain outcome. So I decided to co-operate work with an NGO that was already established and started looking. I wasn’t able to find one that would support me. Neither local nor foreign NGOs: everyone wanted the money – but they didn’t want to spend it the way I had in mind! But for their own projects! But that was absolutely not, what I had in mind. I’d stand with my reputation for the proper use of those funds. I absolutely disagree with the widely accepted ‘trickling-down-effect’. It concedes that a substantial percentage of the donor’s money is syphoned off to people for whom it is absolutely not meant. So I had to turn down the donor’s proposal and relegated him to the Swimming Doctors who do a good job as far as I can see. I’d always and happily be willing to take similar action in an emergency as I did after cyclone Nargis! But only under one condition: That I can hold on to the reins and watch over the use of the funds. I have seen too much wasting of funds that were donated with best intentions only to disappear into unmanageable channels. All our prices are quoted in US dollars. Not included: International airport tax in Yangon, meals except breakfast (unless otherwise agreed), drinks, gratuities and excursions not included in the program. Terms of payment: 50% of the tour price is due upon acceptance of the booking, the remainder at least 7 days before arrival in Myanmar. Deviating agreements require written confirmation. Payment will be made by wire transfer; please contact us for information. If you pay by credit card, please let us know at the time of booking. We charge a surcharge of 2.5 %. Contrary to popular belief, numerous sanctions imposed by Western governments (above all the USA) are still in force and complicate our payment transactions! Of course, there is always a way and we will let you know where your payment should go when it comes to invoicing. Thank you for your understanding! Between 7 and 0 days before arrival: 100% of the total price. Between 14 and 8 days before arrival: 80% of the total price. Between 29 and 15 days before arrival: 60% of the total price. Between 44 and 30 days before arrival: 50% of the total price. Between 60 and 45 days before arrival: 30% of the total price. For some services (e.g. ship passage on a luxury ship like ‘Pandaw’, ‘Paukkan’) etc. as well as for a stay in a beach hotel the cancellation fees may be higher. Please note that it is almost impossible to get a refund for tickets already issued! More details on request! A free place is granted for 16 or more participants; a maximum of 2 free places is allowed. We are only active on behalf of persons or companies. We arrange accommodation, transport and other services and accept no liability for accidents, damage to health, injuries and deaths, losses, delays, loss of means of transport, strikes, acts of war and civil war. Additional costs caused by force majeure, storms or other causes mentioned above by us or companies acting on our behalf cannot be reimbursed. We reserve the right to modify the program if circumstances beyond our control or the interest of the customer require it. In such cases, we will endeavour to offer a reasonable replacement. After the start of the tour, neither the entire tour price nor any unused parts of the tour can be refunded, provided that the loss of services was not caused by our fault.